So I really like what you're doing here and the work you're putting in to your budget limitations. 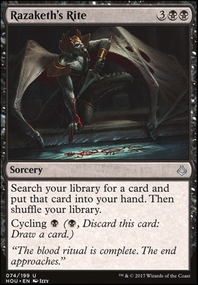 Couple of things to consider: there are two different printings of Diabolic Tutor at 25 cents on SCG. This next card is a little bit more difficult to spare space and card slots for, and would definitely require an absolute need for the card draw, but we have Glint-Sleeve Siphoner who is often too small a body for many people to care about, so it's never a removal priority (usually just killed in boardwipes etc) and is such an excellent 2-drop to find in the early game. Next, to bring this to a new level and create a page on this site that cements you as King of Macar primers, I definitely think you should have 2 upgrade lists put aside that offer upgrades for a $20 budget, and for a $50 budget. Both of those are well in to the sub $100 range that you can call budget, and the first thing I always see people do with decklists is ask "what are some cheap ways I can improve this?" Good work with everything so far, +1 from me. Also your title change gave me a good laugh, I like it. I can tell just by looking at this briefly that this build has been improved over time as it looks very refined. As I am not experienced with this commander, take my comments with a grain of salt as you are more of the expert here. I wonder if you could make use of more token producers - specifically ones that make at least 3 1/1 creatures at a time in order to use Teysa's first ability on demand if she's the only creature in play. Cards that come to mind include: Sengir Autocrat, Benevolent Offering, Increasing Devotion, Entrapment Maneuver, Spectral Procession, Martial Coup. I think you could explore morbid a little more, some cool ones include Skirsdag High Priest, Reaper from the Abyss, Tragic Slip. Tragic Slip could improve your mana curve by replacing Murder. I think more card draw effects would be nice. I'm very surprised to not see Mentor of the Meek in here. I would argue that Read the Bones is strictly better than Painful Lesson. But overall I would consider adding a few more, some that come to mind that play well are: Damnable Pact, Skeletal Scrying, Blood Divination, Altar's Reap, Ancient Craving. I think you could use more mana ramp. Besides mana rocks, you could take advantage of treasures with cards like Pitiless Plunderer. Not sure if you've thought about focusing on strong cards that care about low CMC. Besides Mentor of the Meek, other cool cards could be added (some would even interact with Teysa): Unearth, Sun Titan, Reveillark, Citywide Bust. 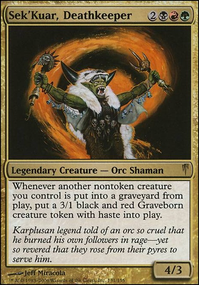 Razaketh, the Foulblooded Not a cheap card at around $6, but could be insane in this deck. 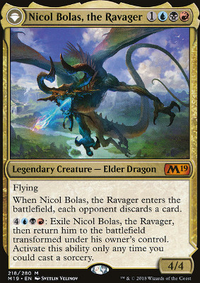 Krav, the Unredeemed I know you said you recently traded him, but it could be worth hunting down another cheap non-foil one and run him with Regna, the Redeemer. Black Market I'm usually very picky when it comes to enchantments at 5+ CMC, but maybe this one would be worth it in a long game since it sees tokens dying. Treasury Thrull - a good effect I'll admit, but I'm just not thrilled with the 6 CMC. 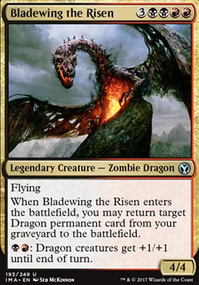 If reviving creatures is your main goal, something like a Hell's Caretaker's effect for less mana might be better. Vizkopa Confessor - looks like a fun card, but I don't like the CMC. Profane Command - I don't know that this should be cut, but I'd encourage you to really ask yourself which modes you typically use because you might be able to get a card with the desired mode for less mana. If X spells are a way for you close out the game, you could consider Exsanguinate or Torment of Hailfire. 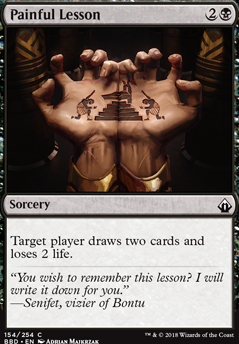 Tamiyo's Journal - looks like a fun card, but idk about the cmc, requires a long game before providing lots of value. Tainted Sigil - I've never seen this card before, does it pay off well? I just don't like that people can see it on the board. Overall, very impression decklist - glad you rebuilt it. Eager to face it next week. I think this deck needs card draws and tutors badly. Boros ain't know for both categories but fear not, as we've Black to the rescue! Mentor of the Meek Hang on, what's a Human doing among the unearthly blood sucking vampires... He actually synergizes very well with the horde of 1/1 tokens that we're putting into play each turn, replenishing our hands as we build an army. Skullclamp a must play since we're generate tokens turn after turn, we should have enough to go around to crack some skulls and draw some cards. Necropotence the go to card for card draw in black. Night's Whisper, Sign in Blood, Painful Lesson, Read the Bones... you get the drift. Vampiric Rites Sac outlet and card draw, with a mini life gain on the side. Scytec Sure, it defiantly sounds interesting. Nekusar also seems really interesting as well and I can see a lot of combos that can be done in a deck with him. Like using Painful Lesson , Mind Rot , etc, like a discard/mill deck. alright so here goes, so the cards to the left can be swapped with the ones to the right, it has the same or very similair effect but for a reduced mana cost etc. Shambling Attendants : Just strictly bad, you dont want to play a 3/5 dude for 8 mana ever. Cruel Feeding : its just pretty bad, the strive cost is very expensive just to +1/0 lifelink. dont use this unless you had something specific in mind that i didnt catch up on reading the list. Duress and Divest : these never really do much, yes you get to pick away 1 card and see 1 hand but you will almost never hit anything especially good, only run this if you are planning to do a lot of 1v1 EDH.